But the department’s latest bulletin illustrates the uneven nature of year-on-year change, particularly at primary level, with falling enrolments in six counties or administrative areas, predominantly on the western seaboard, while Leitrim was static. 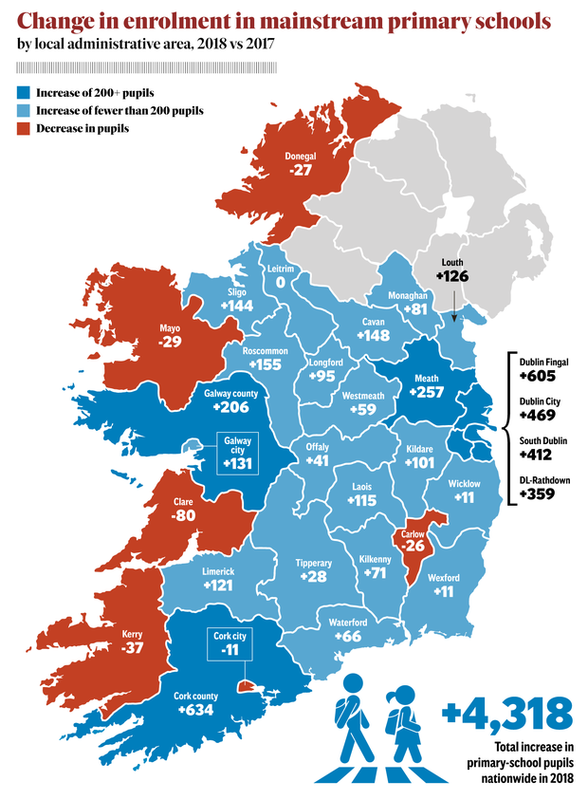 The biggest decline was in Co Clare, down 80 pupils – from 13,682 to 13,602 – followed by Kerry (-39), Mayo (-29), Donegal (-27). There was also a dip in Carlow (-26) and Cork city (-11). Although Roscommon’s 2pc rise was the largest percentage increase, the county has the smallest schools, at an average 86 pupils each. There is no obvious reason for this, but it may be linked, in part at least, to a reported flow of students to so-called “grind schools”, which are not included in Department of Education statistics.